The Monash Residential Services and Non-Residential Colleges annual College Clash was held on the 14 March, 2018. Monash Sport opens our grounds to over 1,000 students from 21 Halls and Colleges for this evening of challenges catered to a range of skills and abilities. 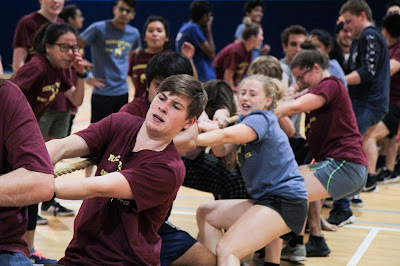 Throughout the evening, the students were able to compete in; basketball shootouts, cup stacking, skipping-rope challenges, 100-piece puzzle solving, 2 inflatable obstacle courses, giant tug of war, and the crowd favourite - tunnel-ball. The evening ended with the wipeout competition, a tough challenge testing students' ability to balance on 4 large inflatable spheres. The key aspect of this event is the large-scale student engagement, through participation and support for the team. Monash Sport is incredibly proud to be able to host such a fantastic event and looks forward to doing it all again in 2019.